Since September, I’ve been learning how to use waxed linen cord, and experimenting with it for sacred jewelry-making. 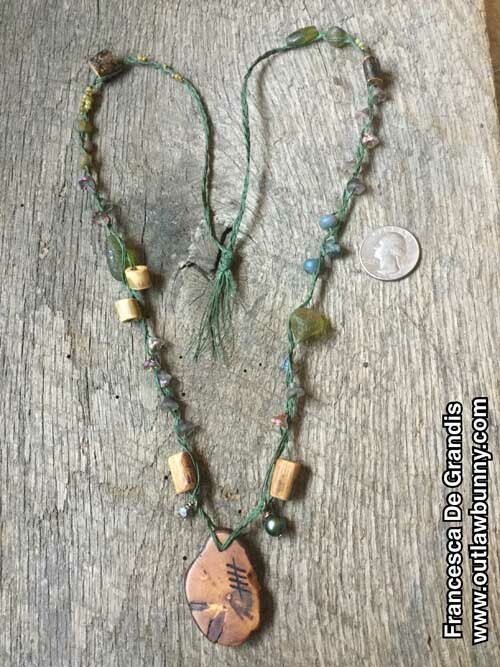 Developing my own style of using waxed linen cord was necessary to make necklaces I’d envisioned. I not only studied techniques for waxed linen cord, I also created a few myself. Then I practiced them all. Creating techniques required experiments, which resulted in some necklaces that took a lot of time to construct but were not up to snuff. Though I took them apart, the mistakes I made taught me how to do things right. That is the way of experiments. 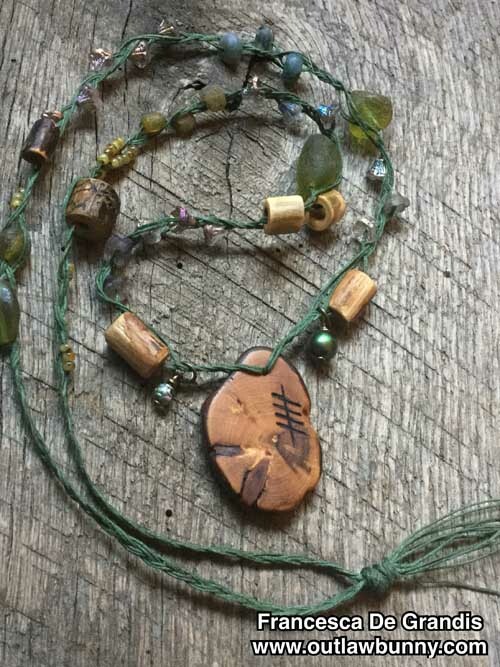 Doing everything outlined above allowed me to create talismanic necklaces I love wearing, and to start making some to sell. The above photos show a necklace I made for myself. Wearing it makes me happy, so the months I took figuring out how to make a necklace like that were worthwhile. I’m thrilled with how my first attempt at using wax linen cord turned out. I have a single gold hoop earring I almost always wear, and I often hang a little talisman from it. If you know me, you know I live and breathe amulets. 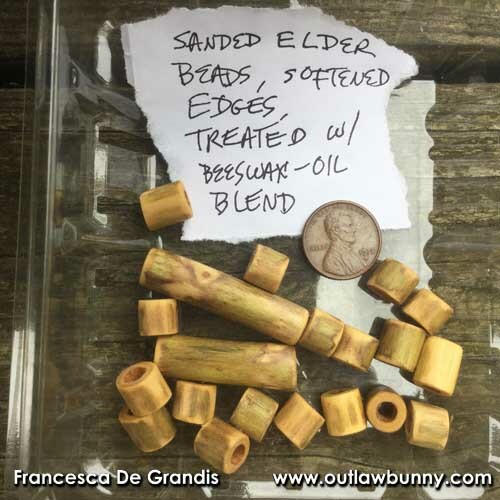 I’d made some tiny beads out of elder wood. Wee items hold huge enchantment. I wanted to hang one of the beads on my gold earring and, though I usually use brass or copper wire, neither seemed right for this. Then I thought of the linen cord I recently purchased for another project I haven’t had a chance to do yet. With no patience for using a pattern, and an almost complete inability to follow one, I simply braided three pieces of linen cord. Instead of braiding their entire length, I braided their middle section. To stabilize the cords so my braiding wouldn’t come out messy, I tied a loose knot where the braid was going to start. When finished braiding, I undid the knot. Simple. Next, I tied the two ends of the braid together (or perhaps I tied them right below where the braid ended), creating a loop to hang the talisman on the earring. Can you see in the photo how tiny yet neat the braid is? I’m proud of that. Next came hanging the elder bead on the portion of the cords that extended below the braided loop. The hole in the elder would’ve slipped right over any knots, so I added a smaller bead on both sides of the elder. Since I’d folded three strings over to make the loop, I had six little dangling cords, which went through the elder and the bead on each side of it. That left those six cords hanging below the beads. So I added little dangles, one per two cords. 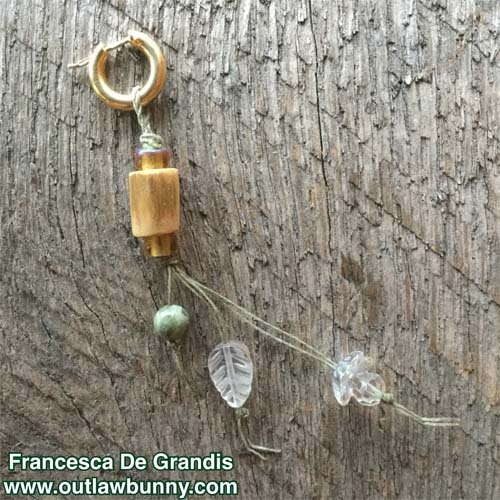 The dangles are all beads I’ve had for a while; it’s special to use treasures I collect that have sat unused for years. The top dangle looks like it might be agate. It has a lot of detail and is, I suspect, a portal into a Fey forest. Anything wee with a lot of detail is a treasure. The leaf is quartz crystal. The flower is comprised of a glass bead and a manufactured crystal that might be Austrian. I’m thrilled. For one thing, waxed linen cord truly surprised me; it is a creature unto itself; there are all sorts of things I’m going to be able to do that never quite worked with wire, waxed cotton cord, or anything else. Wow, so much potential! I can’t imagine what I made working structurally with anything other than waxed linen cord. E.g., if I used something else, I might have had to put glue on the knots, and I avoid glue in my jewelry because I always add too much and end up with a big obvious blob. 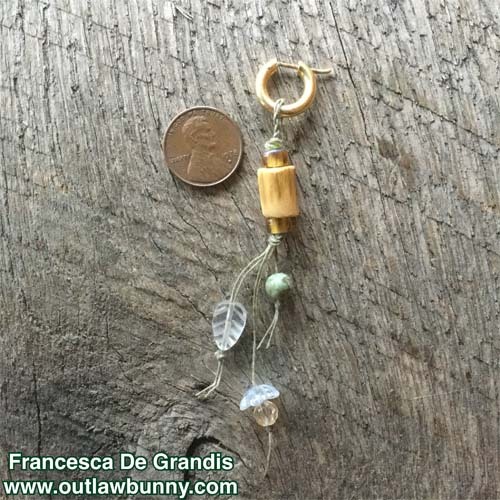 Another example: I don’t think I could’ve made such a tiny yet neat braid, if it hadn’t been waxed linen. This cord is only .4mm, yet totally manageable, cooperative, and more. As I said, I can’t imagine anything else making this piece work. The other reason I’m thrilled is I came up with a simple pattern I can use again and again. I have a new pattern in my repertoire that I’ll apply a lot of ways. 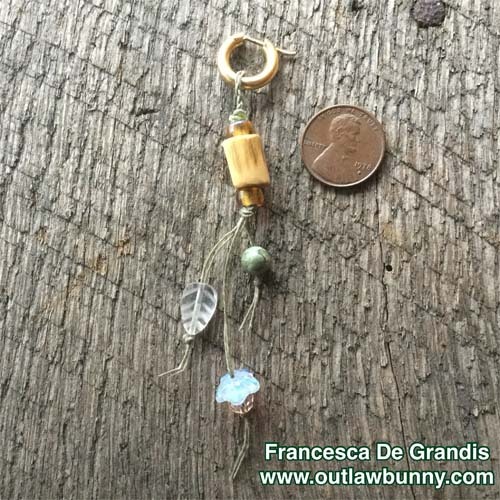 In the above pic of the elder wood beads I made, you can see how tiny they are, if you look at the penny next to them. Am I crazy to have done all the work needed to create tiny wooden bits? Divine madness! I even sanded the ends so edges would be soft-looking instead of blunt. Divine madness! (The two larger beads were much easier, even though they’re small when it comes to woodworking.) I’m happy. Wee objects hold special magic. Wearing my new talisman, I feel the Elder Tree Goddess blessing my spirit. Please note: The person from whom I acquire most of the amazing wood I use is no longer a supplier. Despite months of searching, I haven’t found other sources for the diversity and quality of wood I require. So I don’t know how long I’ll continue crafting wood talisman sets. Also, making wooden talismans is part of a quest I’m on. I don’t know if I’ll continue to craft the sets when the quest ends. Before the quest, I only made a few wood charms, now and then. 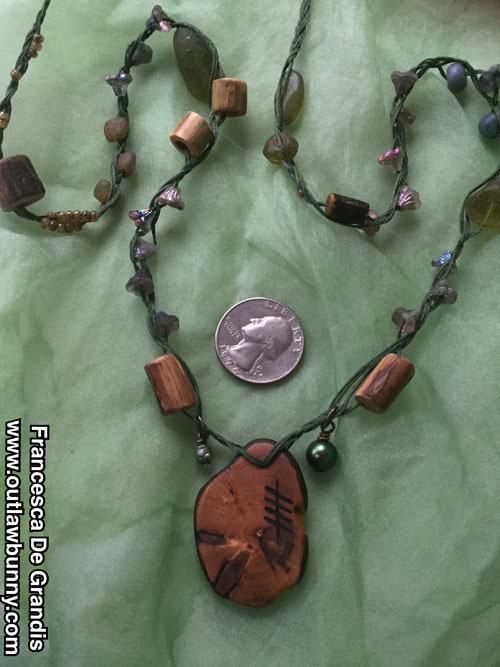 This entry was posted in Art, Writing, and Music, Spirit, The Whole Thing and tagged agate, amulets, Austrian, bead, beads, charms, cord, crystal, De Grandis, DeGrandis, divine, elder, elder tree, fey, forest, Francesca, Francesca De Grandis, goddess, jewelry, Leaf, linen, madness, magic, necklaces, pattern, portal, quartz, quest, Sacred, talisman, talismans, waxed, waxed linen cord, wood, wood beads, wooden beads, woodworking. Bookmark the permalink.